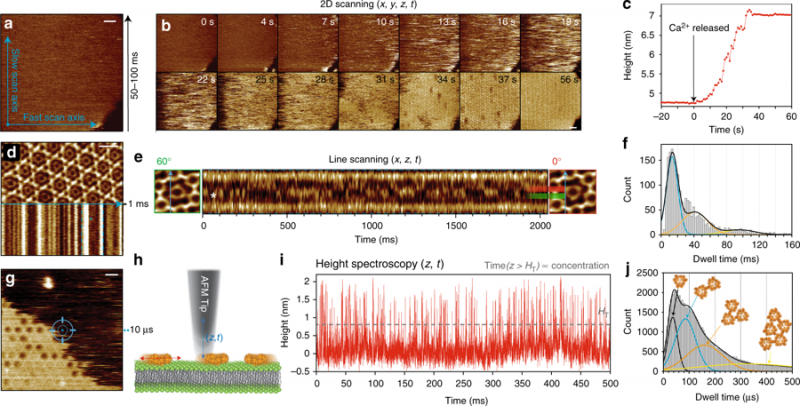 In their recent publication “High-speed AFM height spectroscopy reveals μs-dynamics of unlabeled biomolecules” in Nature Communications George R. Heath and Simon Sheuring develop and apply HS-AFM height spectroscopy (HS-AFM-HS, a technique inspired by fluorescence spectroscopy), a technique whereby the AFM tip is held at a fixed x–y position and the height fluctuations under the tip in z-direction with Angstrom spatial and 10µs temporal resolution are monitored. They demonstrate “how this technique can be used to simultaneously measure surface concentrations, diffusion rates and oligomer sizes of highly mobile annexin-V molecules during membrane-binding and self-assembly at model membranes and derive its kinetic and energetic terms. Additionally, HS-AFM-HS at specific positions in the annexin lattice where the freedom of movement is restricted to rotation allowed determination of the interaction free energies of protein-protein contacts.”* The applicability of this technique is wide and is discussed at the end of the publication. NanoWorld Ultra-Short Cantilevers (USC) for Fast-/High-Speed AFM ( USC-F1.2-k0.15 ) were used. Congratulations to the authors to this publication which pushes the speed limits of AFM even further! Open Access The article “High-speed AFM height spectroscopy reveals μ s-dynamics of unlabeled biomolecules” by George R. Heath & Simon Scheuring is licensed under a Creative Commons Attribution 4.0 International License, which permits use, sharing, adaptation, distribution and reproduction in any medium or format, as long as you give appropriate credit to the original author(s) and the source, provide a link to the Creative Commons license, and indicate if changes were made. The images or other third party material in this article are included in the article’s Creative Commons license, unless indicated otherwise in a credit line to the material. If material is not included in the article’s Creative Commons license and your intended use is not permitted by statutory regulation or exceeds the permitted use, you will need to obtain permission directly from the copyright holder. To view a copy of this license, visit http://creativecommons.org/licenses/by/4.0/. In the article “Direct observation of dynamic interaction between a functional group in a single SBR chain and an inorganic matter surface” Ken-ichi Shinohara and Yuu Makida use atomic force microscopy (AFM) video imaging to closely investigate the behaviour of functionalized and unmodified styrene-butadiene rubber (SBR), as models for tire rubber, on mica surfaces. Figure 3 from “Direct observation of dynamic interaction between a functional group in a single SBR chain and an inorganic matter surface” by Ken-ichi Shinohara & Yuu Makida: (A) Single-molecule imaging of the structure of two isolated polymer chains of carboxyl-functionalized styrene-butadiene rubber (SBR) on mica under n-octylbenzene at 25 ± 1 °C (Movie S5). Snapshot AFM image of a fast-scanning atomic force microscopy (AFM) movie; X: 200 nm, Y: 150 nm, Z: 7.2 nm. Rate: 5.0 fps. (B) A snapshot of all-atom MD simulated structure of a single chain of carboxyl-functionalized SBR (CPK model) in n-octylbenzene as a solvent. Dynamic globular (ball-like) structures were formed partially in a SBR chain. The position of carboxyl group was indicated by an arrow. The backbone was displayed in purple. Solvent molecules are indicated by line model and hydrogen atoms are omitted for simplified to view. The article “Direct observation of dynamic interaction between a functional group in a single SBR chain and an inorganic matter surface” by Ken-ichi Shinohara & Yuu Makida is licensed under a Creative Commons Attribution 4.0 International License, which permits use, sharing, adaptation, distribution and reproduction in any medium or format, as long as you give appropriate credit to the original author(s) and the source, provide a link to the Creative Commons license, and indicate if changes were made. The images or other third party material in this article are included in the article’s Creative Commons license, unless indicated otherwise in a credit line to the material. If material is not included in the article’s Creative Commons license and your intended use is not permitted by statutory regulation or exceeds the permitted use, you will need to obtain permission directly from the copyright holder. To view a copy of this license, visit http://creativecommons.org/licenses/by/4.0/. The AFM images for this article were taken in high-speed AC mode using NanoWorld Ultra-Short Cantilevers of the USC-F0.3-k0.3 type. 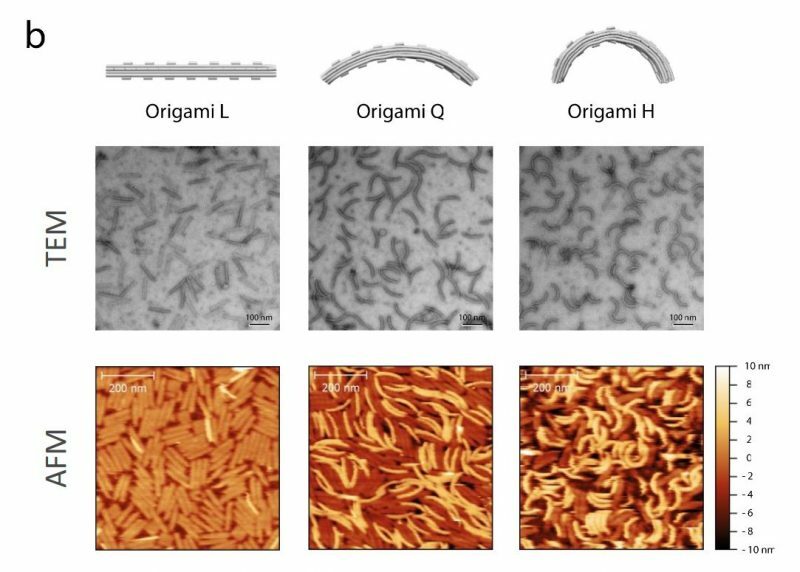 Characterization of folded DNA origami nanoscaffolds. b) Structure of folded bare origami L, Q and H was further validated using negative-stain transmission electron microscopy (TEM; scale bars: 100 nm) and atomic force microscopy (AFM; scale bars: 200nm). Open Access: The article “Membrane sculpting by curved DNA origami scaffolds” by Franquelim et. al is licensed under a Creative Commons Attribution 4.0 International License, which permits use, sharing, adaptation, distribution and reproduction in any medium or format, as long as you give appropriate credit to the original author(s) and the source, provide a link to the Creative Commons license, and indicate if changes were made. The images or other third party material in this article are included in the article’s Creative Commons license, unless indicated otherwise in a credit line to the material. If material is not included in the article’s Creative Commons license and your intended use is not permitted by statutory regulation or exceeds the permitted use, you will need to obtain permission directly from the copyright holder. To view a copy of this license, visit http://creativecommons.org/licenses/by/4.0/.